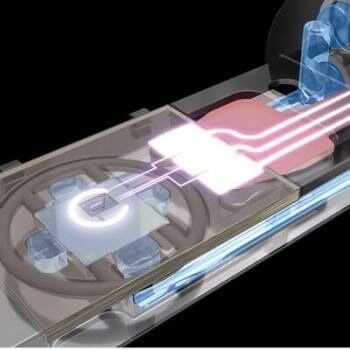 The Poseidon Select from Protochips seals a liquid environment between two electron-transparent membranes allowing users to image processes and materials in real time. The Poseidon Select encapsulates liquids reliably within the microscope, allowing visualization of several nanoscale processes and environments. With self-aligning parts and a number of E-chip configurations, the Poseidon Select expands the capability of a user’s microscope with unrivaled experiment simplicity. The Poseidon Select can be easily assembled within 15 minutes and features self-aligning parts that guarantee flawless chip alignment consistently. A single O-ring gasket forms a hermetic seal that securely confines the liquid between two E-chip membranes without maximizing counts, hampering direct line-of-sight to EDS detectors, and enabling elemental analysis of any sample. Ideal for analyzing materials ranging from emulsions and batteries to whole cells and nanoparticles, the Poseidon Select allows imaging of a wide variety of dynamic processes in liquid. Offering embedded electrodes and heaters within select E-chips, the Poseidon system provides low-noise electrochemistry capabilities and liquid heating up to 100 °C, paving the way for in situ experiment opportunities. Thoroughly tested and approved by the leading microscope manufacturers, the Poseidon Select delivers flowing and static liquid control to the TEM microscope. It has been featured in numerous publications, and globally, researchers and scientists rely on its simplicity, versatility, and performance to speed up their research. Every Protochips in situ holder is run by Clarity workflow-driven software, using a wide range of MEMS-based E-chips and accessories to ideally fit one’s research requirements. All of these components are completely approved by the leading microscope manufacturers to meet their demanding standards for compatibility, safety, and reliability.